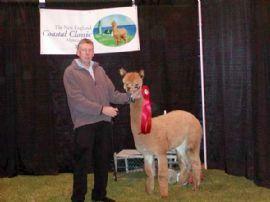 1st Cria - Misty Champion! 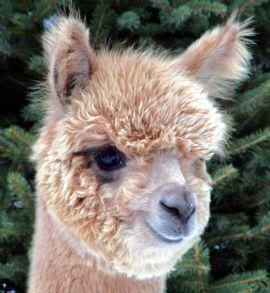 2012 Male Cria Blue Ribbon Winner! Peruvian - A Don Julio grandson. Peruvian & Chilean - Angelina is Breaya's second offspring, the first was light brown male that has gone on to be a herdsire. This girl is the real deal, the total package! 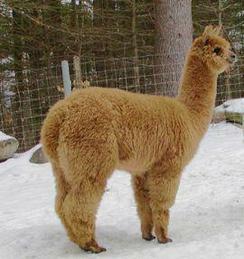 Angelina is well balanced, big boned and has crimpy, bright fleece. Her fiber coverage is incredible, her bite right on. Her bloodlines include Peruvian Drambruie and Peruvian Don Julio.what a background, what a fabulous girl. She has already produced 2 color champions for us. 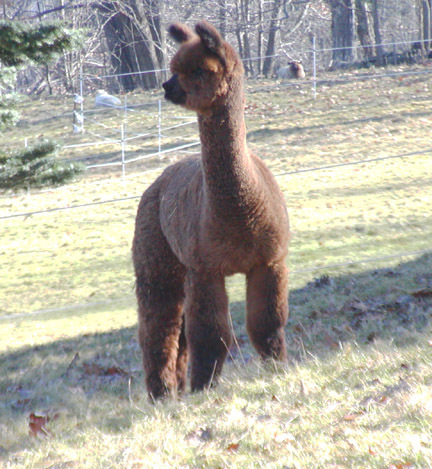 Her first cria, Smoky Mist, is just phenomenal (a color champion). 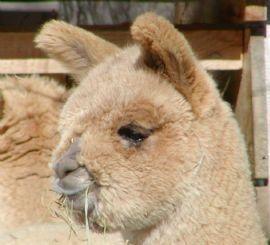 Her second cria, born in 2005 was a beautiful beige female. 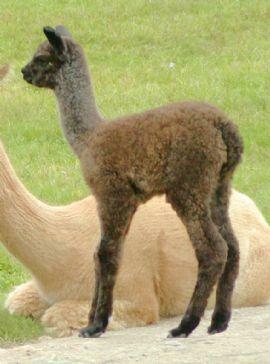 Angelina had a fawn male cria, a Royal Rose grandson, born in 2006. In 2007 she delivered a solid dark gray female that has gone on to become a color champ as well - wowsers!! and we were tickled with our 2008 Boomer x Angelina male, Sonic Boom, he's already a blue ribbon winner! 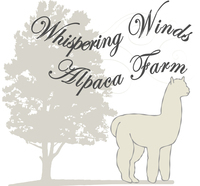 On June 23rd, 2010, Angelina gave birth to an amazing NM Beethoven female cria, she is bay black or dark brown and has incredible fleece - double wowsers! Angelina placed 2nd in her full fleece class at the 2003 Big E in Springfield Massachusetts.